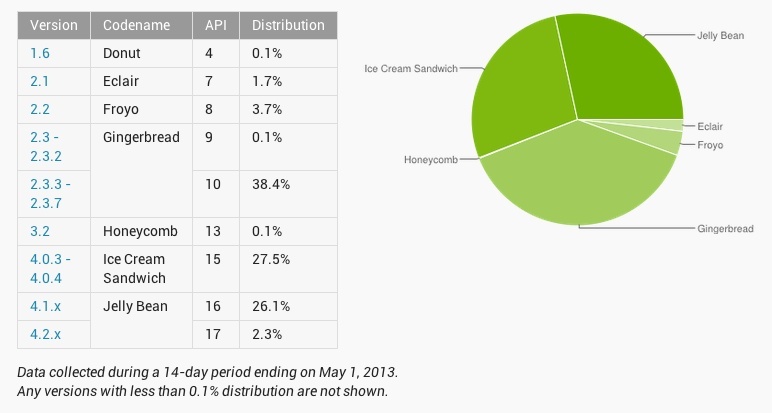 The Android team updated their OS distribution numbers for the beginning of May this afternoon, showing what appears to be a slight jump for Jelly Bean at 28.4%, which is up from the 25% it topped off at in the beginning of April. We’re seeing a decline in Ice Cream Sandwich’s piece of the pie, which is likely due to devices running Android 4.0+ jumping to Android 4.1+ over the last month. We have seen a number of Jelly Bean updates, after all. Gingerbread dropped to 38.5%, Honeycomb is barely alive at 0.1%, Froyo dipped to 3.6%, and the rest of the numbers didn’t move for Eclair and Donut.